Even when a large proportion of the British Army was always stationed overseas, regiments needed a Headquarters and base in Britain. This provided the functions needed to support the battalions posted elsewhere, and a centre for recruitment and training. 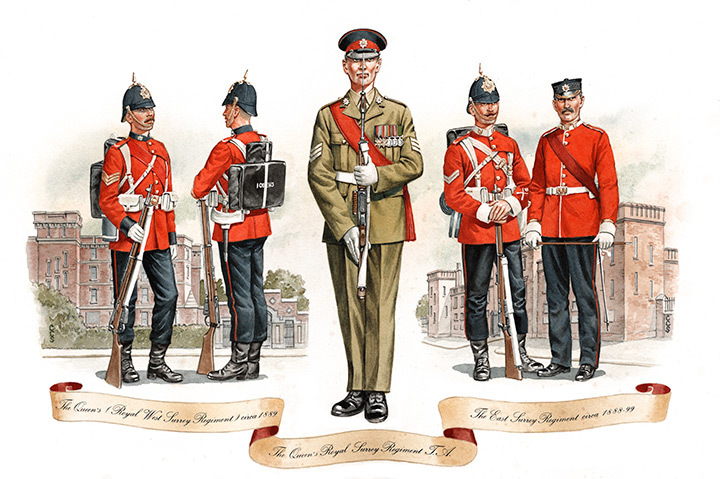 This system reached its peak when infantry regiments were assigned to counties in 1881; thus The Queen's Royal Regiment had its depot at Stoughton Barracks, Guildford, and the East Surrey Regiment its at Kingston Barracks. With the amalgamation into the Queen's Royal Surrey Regiment in 1959, the Regimental Headquarters remained in Kingston on Thames (initially at Kingston Barracks before moving to the Portsmouth Road Drill Hall), but the rest of the depot functions were amalgamated with those of the other regiments of the Home Counties Brigade at Canterbury. Part-time volunteer units also needed headquarters and bases for recruitment, training and equipment. Volunteer and Militia units were sometimes based with convenient Regular Battalions, but often had quarters of their own, quite often provided by the local community or a rich benefactor. From the formation of the Territorial Army (originally "Territorial Force") in 1908, formed initially from existing Volunteer battalions, a more organised system of Territorial Army Centres came into being. Some TA Centres were large, accommodating one or more battalions but, outside large towns and cities, the TA relied on recruiting and training from a widespread and scattered population; as a result, many TA centres were quite small, accommodating no more than a Company (about 120 men) or just a platoon (about 30 men).